Their comments came in a statement during an audience with Pope Francis in the Clementine Hall of the Apostolic Palace. 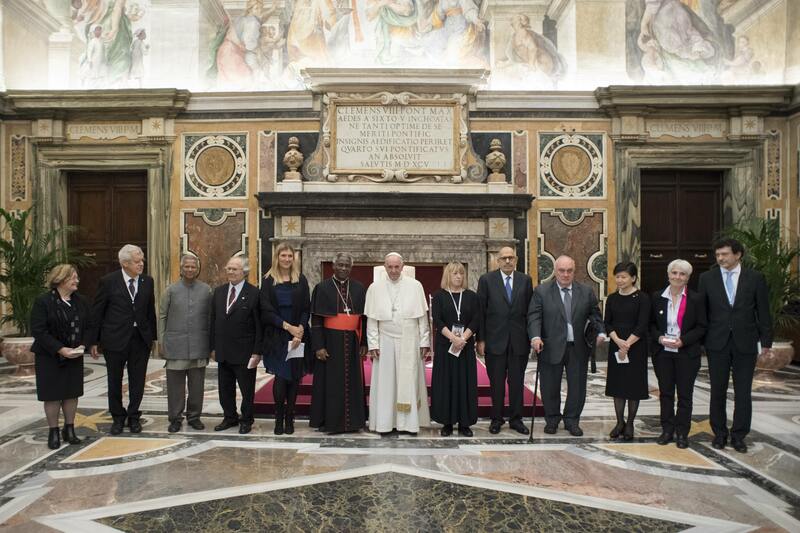 The Holy Father Francis received the participants of the International Symposium on Disarmament entitled Prospects for a world free of nuclear weapons and for Integral Disarmament, promoted by the Dicastery for the Promotion of Integral Human Development, held November 10-11. “Banning nuclear weapons and promoting Peace and an integral disarmament means putting humanity first and putting our minds together to meet the serious challenges we face– climate change; a globalized economy that glorifies the accumulation of wealth for wealth’s sake and cares little for meeting the needs of the majority of the billions of people sharing our planet; and terrorism of all kinds, including that of the state to name just a few,” the statement said. We welcome with deep gratitude the attention that you give to the pressing issues of our time. In particular, at this moment of deep tension among nuclear armed states we applaud your new initiatives to achieve world Peace and to tackle nuclear weapons as well as integral disarmament overall. It was the concerted action of civil society, religious communities, international organizations and the states that fervently desire a nuclear free world that resulted in the successful nuclear ban treaty negotiations at the UN. Ultimately, it will be the ongoing work of these sectors of society that will open the way for nuclear states to finally relinquish these weapons that are capable of obliterating life as we know it in the blink of an eye. It will not be an easy task, but it is possible. Eliminating nuclear weapons alone would release resources to make this shift. With integral disarmament the possibilities are limitless. We need to create a mechanism for a multinational control of the production of fissile material. This would counteract an emerging phenomenon of more and more countries becoming “nuclear-weapon-capable states”, possessing the technology that could be used to make nuclear weapons, if they so choose. For any such mechanism to succeed, however, it must be universal, equitable, and apolitical. As we focus on complete nuclear disarmament, we must also keep our attention on emerging lethal autonomous weapons systems that on their own could target and kill human beings. It is imperative to ask ourselves what ethical and moral human beings can possibly believe that it is fine to give machines the ability to kill humans. The best solution to this impending third revolution in warfare is to preemptively ban such weapons before they appear on the battlefield. Banning nuclear weapons and promoting Peace and an integral disarmament means putting humanity first and putting our minds together to meet the serious challenges we face– climate change; a globalized economy that glorifies the accumulation of wealth for wealth’s sake and cares little for meeting the needs of the majority of the billions of people sharing our planet; and terrorism of all kinds, including that of the state to name just a few. National security frameworks that rely on weapons, militaries, and the projection of state power cannot possibility protect us from the challenges of today’s world. It is time to recognize that real security comes from placing the focus on meeting the needs of individuals and communities – human security and protecting and promoting the common good. Your Holiness, thank you for your efforts to benefit all of humanity. We are ready to support your new disarmament initiatives in any way that would prove useful. Time for a Weaponless World?